Neuroimaging data obtained from a small group of smokers predicts the influence of a large anti-smoking media campaign targeting likely smokers, shows a new study published in JNeurosci. This approach could help improve informational materials designed to change people’s attitudes and behaviors. Bruce Dore, Emily Falk and colleagues identified a neural pathway between the amygdala — which is sensitive to emotional content — and the ventromedial prefrontal cortex that predicted the efficacy of graphic anti-smoking messages. The images that smokers said made them want to quit were the same ones that encouraged likely smokers to click through for more information in a New York State Smokers’ Quit Line email campaign. 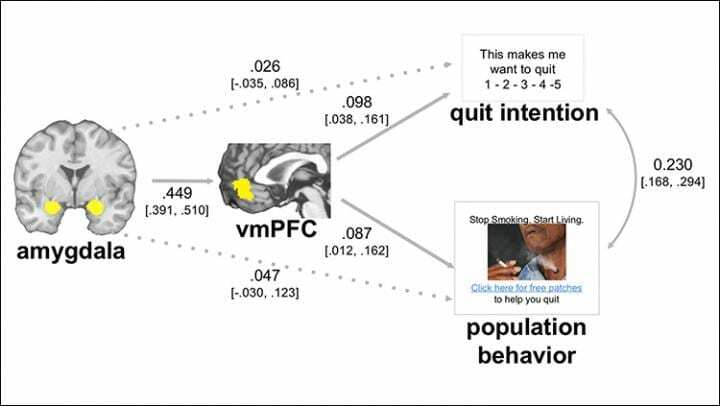 Further, images that elicited higher amygdala and vmPFC activity were also more successful in the email campaign – a relationship that was particularly clear when smokers showed low expression of a pattern of brain activity characteristic of emotion regulation. Together these results suggest neuroimaging can be used to predict individual- and population-level responses to persuasive health messages. JNeurosci, the Society for Neuroscience’s first journal, was launched in 1981 as a means to communicate the findings of the highest quality neuroscience research to the growing field. Today, the journal remains committed to publishing cutting-edge neuroscience that will have an immediate and lasting scientific impact, while responding to authors’ changing publishing needs, representing breadth of the field and diversity in authorship. The Society for Neuroscience is the world’s largest organization of scientists and physicians devoted to understanding the brain and nervous system. The nonprofit organization, founded in 1969, now has nearly 37,000 members in more than 90 countries and over 130 chapters worldwide. How are pulsed electric fields being used in cancer therapy?